Take fresh mushrooms (about 50 grams), clean them and cut into thin slices. Add some oil to a pan and begin to heat it up. Add mushrooms, and heat until they become soft. Occasionally add small amounts of water. When the mushrooms get soft, heat for a bit longer, until the water evaporates. That way, you will be left only with softened mushrooms and some oil. 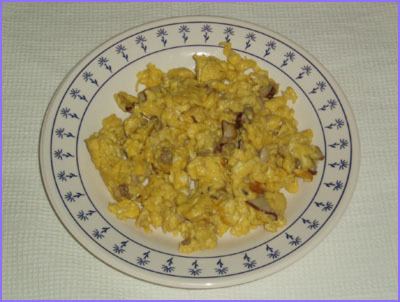 Then add the previously beaten eggs (2-3 pieces), and occasionally stir. When they take on a golden yellow color and when they thicken enough, the meal is done. If you like your omelette more roasted, you can heat it for a bit longer. It is even better when served with some vegetables. Various types of mushrooms can be used for this meals: Agaricus abruptibulbus, Boletus aereus, Boletus edulis, Boletus luridiformis, Cantharellus cibarius (very tasty), Hydnum repandum, Russula heterophylla, Russula cyanoxantha, but many other as well.